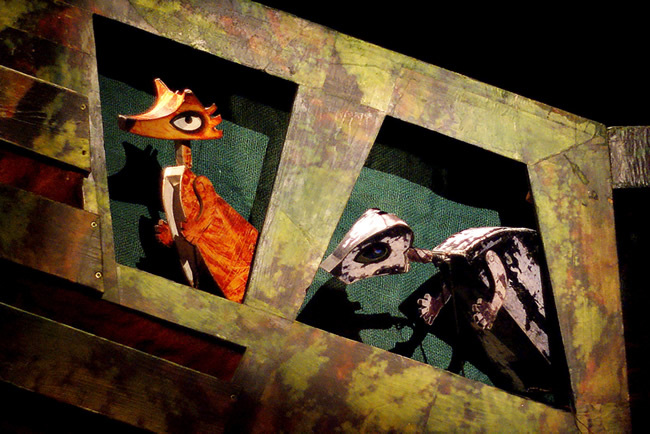 The Really Kid Friendly Blog: The Fantastic Mr Fox is, well, fantastic! Fantastic Mr Fox is one of everyone’s favourite Roald Dahl books – up there with Charlie and The Chocolate Factory, James and The Giant Peach and Matilda. It’s the action-packed tale of Mr Fox and his family’s battle with the three greedy farmers Boggis, Bunce and Bean. Mr Fox is forever stealing their chickens, turkeys, ducks and geese, so the farmers try to shoot, starve and dig him out of his hole. But, of course, Mr Fox is too clever for them – although they do manage to shoot off his bushy tail. The book is quite in vogue now, with a quirky animated movie voiced by the likes of George Clooney, Bill Murray and Meryl Streep. So a new puppet production is well timed. Fantastic Mr Fox is playing at Islington’s charming Little Angel puppet theatre from September 11 to November 7. We saw the play on a Sunday afternoon, and the little theatre was packed with excited parents and children. Small children sit on the aisle seats so their views of the fantastic puppetry aren’t obstructed. The three four-year-olds in my party were gripped throughout, although one was sufficiently scared to have to sit on her daddy’s lap. I wouldn’t recommend the play for children under four, or any that are particularly frightened of the dark – or smelly farmers, for that matter. There’s plenty of laughs for the kids, plus songs and fun interaction when the characters walk down the aisles, sniffing for rats or feeding the animals. My daughter was particularly thrilled when Farmer Bean’s maid stuck her big bottom in her face. The set gradually sheds layers as the cunning foxes dig under the hapless farmers’ coops and storerooms, bringing food for all the other animals hiding from the humans. Mr Badger is particularly fond of Farmer Bean’s cider cellar. 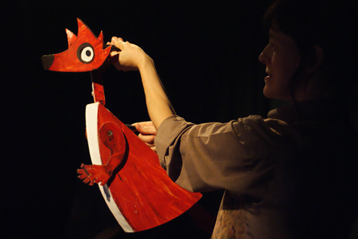 All the excited kids and parents I talked to after the show gave the production a big thumbs up, running into the light clutching their fox finger puppets. The show lasts an hour and 20 minutes, with a 15-minute interval.